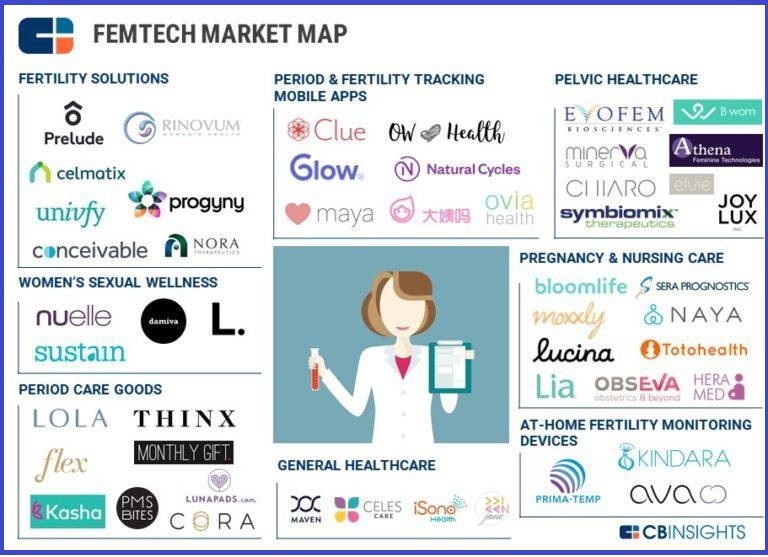 So great to see this femtech market map infographic – we know that many of our medtech and digital health clients struggle with fundraising. This is great news – over $1.1 billion raised for medtech women’s health startups! It’s about time because for so long, women’s health has been underfunded. That never made sense to me, and I have watched (and worked for) medtech companies that struggle with this market. Too many physicians (second only to primary care, ACOG, the American College of Obstetricians and Gynecologists, boasts over 43,000 members, a medtech sales and marketing budget nightmare). Too many sub-specialties. Too many commodity items. The infographic is great but the real information is in the list below (in alphabetical order) that shows exactly where this $1.1 B in funding is coming from (VCs, etc.). Some of the investment amounts are small, but others are impressive such as $690,000 for Lia, a pregnancy test startup or $2 million for period care products, funded by our own MassChallenge, right here in Massachusetts. Maybe this is another sign of the medtech funding renaissance…. Fertility – This market is self-pay in some areas and covered by insurance in others. They include IVF, egg freezing, embryo screening, egg donation and medical treatments for female infertility. Mobile apps are in development for self-tracking of periods and fertility cycles. Pregnancy and Nursing Care – I love this one. In this category, startups include tech-enhanced breast pumps and diagnostic tests to track risks of pregnancy complications for pregnant women. Pelvic Healthcare – Some startups want to improve the clinical healthcare experience for women through telemedicine and genomics-based personalized solutions. Period Care Products – Organic cotton tampons – what a great idea! Or, direct-to-consumer absorbent underwear that can replace pads and tampons. Women’s Sexual Wellness – Startups offering lubricants to help women improve sexual wellness. By the way, the Medtech Executive Women’s Survey has been analyzed and an article has been written that is en route to MDDI. Stay tuned. The infographic and most up-to-date list was created by CB Insights can be accessed at this link.